With an increasing workload and less time per patient, hearing care professionals are looking for efficient ways of programming solutions, without compromising patient outcome. This is why we developed Naida Link™, a dedicated portfolio of hearing aids designed to work with the Naida CI Q90 sound processor. 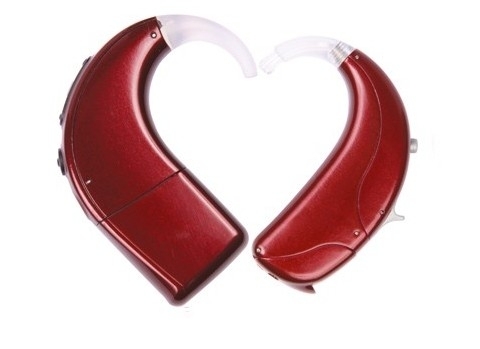 Conventional hearing aid prescriptions do not align acoustic and electric processing, making it time consuming to fit a hearing aid alongside a cochlear implant. 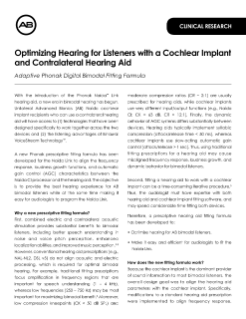 Learn about the unique Bimodal Fitting Formula and Bimodal Fitting Report that seamlessly align the front end processing of the Naída CI sound processor and Naída Link hearing aid to provide the most balanced bimodal hearing in the fewest steps. CI recipients want to hear their best in even the most challenging listening environments. Learn about the unique Binaural VoiceStream Technology™ that enables the Naída CI and Naída Link devices to share sound signals with each other so that when one ear has a clear listening advantage, your patients can hear better sound in both ears. As your patients' hearing needs change, there is always an easy-to-fit solution for the contralateral ear to maximize their hearing benefit. Learn about the Portfolio of Hearing Solutions from Phonak and AB that work alongside the Naída CI Q90 sound processor and take advantage of the same Binaural VoiceStream Technology. To see what other professional tools and resources are available to you, join the AB Professional Portal.